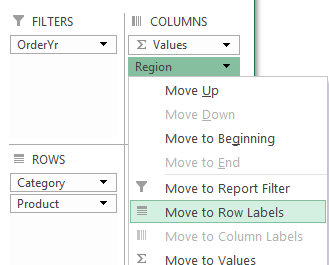 For protection and restrictions on Data Model pivot tables, go to the Pivot Table Data Model Restrictions page. 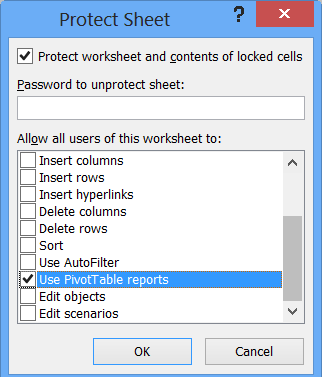 You can protect a worksheet and allow users to make some changes to the pivot tables. However, there are some restrictions on the pivot table functions, when the sheet is protected. Watch this video to see how to set up the protections, and there are written details below the video. When you protect a worksheet, you can add a check mark in the options list, to allow the use of pivot tables. Even if you allow the use of pivot tables on a protected worksheet, there are limitation to what you can do. NOTE: Pivot tables on other sheets may be limited too, if they are based on the same pivot cache. To use these features, temporarily unprotect the worksheet. 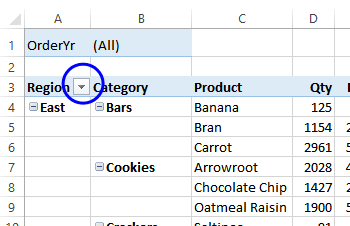 To protect the pivot table selections from being changed, you can use a macro to disable selection. The dropdown arrows will disappear from the field buttons, and you won't be able to change the displayed items. To see the steps in a video, go to the Pivot Table Filter Videos page. Note: You could also disable selection for a specific field. In this example, the arrow is removed from the first Report Filter field (PageFields). The following macro enables the features that were turned off in the DisableSelection macro, shown above. The drop down arrows are visible again. Note: You could also enable selection for a specific field. In this example, the arrow is shown only for the "Region" field. To do this, run the DisableSelection macro (above), then run this EnableSelectionSelPF macro. 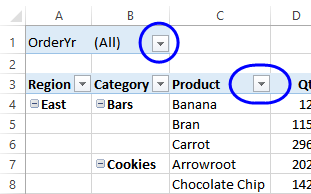 You can use a macro to disable many of the features in a pivot table. The following code prevents users from dragging any of the fields to a different location, or off the pivot table. It also prevents them from using the Field List, Field Settings, or Drilldown, and disables the Refresh feature. The following macro enables the features that were turned off in the RestrictPivotTable macro, shown above. For example, you are able to move the fields to a different area. The macros in the previous sections are set up to run on the first pivot table on the active worksheet. You can change the macros slightly, so they run on all pivot tables on the active sheet, or all pivot tables, on all sheets in the active workbook. For example, here is the EnableSelection macro, revised to run on all pivot tables in the active sheet. NOTE: If you are using "For Each pf in pt. PivotFields", add an If...Then section, to ensure that the code doesn't run on the "Values" field (called "Data" in older versions), which is created when there are multiple value fields. The example below will run on all pivot tables on the active sheet..
For example, here is the EnableSelectionAllPT macro, revised to run on all pivot tables, on all sheets, in the active workbook. 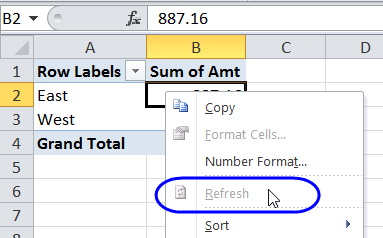 When a worksheet is protected, you can't refresh the pivot tables on that sheet. You could manually unprotect the worksheet, refresh the pivot table, and then protect the sheet again. If you're trying to refresh the pivot table with a macro, add code to unprotect the worksheet, refresh the pivot table, and then protect the sheet again. This macro shows an example. 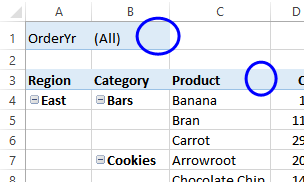 NOTE: If other pivot tables are connected to the same pivot cache are on protected sheets, you can use the code below, to unprotect all the sheets. If you try to refresh a pivot table, you might see a message that says: "That command cannot be performed while a protected sheet contains another PivotTable report based on the same source data." This occurs if the pivot table that you're trying to refresh shares the same pivot cache as another pivot table, and that pivot table is on a protected sheet. As the message says, you could manually unprotect the other sheet, and then refresh the pivot table. 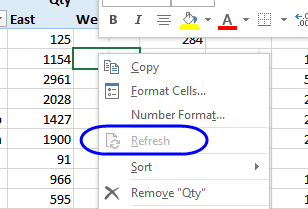 Another option, if you're trying to refresh the pivot table programmatically, is to unprotect all the sheets, refresh the pivot tables, and then protect the sheets again. 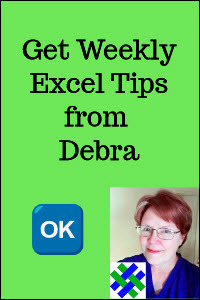 Download the sample pivot table tutorial file. The zipped file is in xlsm format, and contains macros. Be sure to enable macros when opening the file, if you want to test the macros.